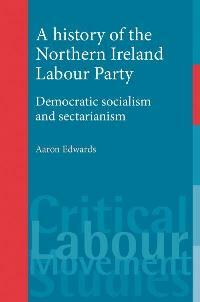 Aaron Edwards presents a highly readable account of the Northern Ireland Labour Party. Professor Jon Tonge believes this to be a model study of the party’s successes and lows, weaving interviews with former party members with detailed archival trawls. A History of the Northern Ireland Labour Party: Democratic Socialism and Sectarianism. Aaron Edwards. Manchester University Press. 240 pages. February 2009. From its foundation in 1924 until disbandment in 1987, the Northern Ireland Labour Party (NILP) offered partial rebuttal of the dominant perception that Northern Ireland was a region beset with rigid electoral tribalism. Protestant British Unionism versus Catholic Irish Nationalism zero-sum game politics prevailed, but the NILP provided a modest rebuttal of the orthodoxy that ethno-religious outlook was everything, with social class mere embellishment and detail. A sister party of its British counterpart (and author Aaron Edwards chronicles the ups and downs of that relationship very effectively), the NILP polled 100,000 votes in both the 1964 and 1970 Westminster elections and was represented in the Northern Ireland Parliament in the 1920s, and again from the 1950s, until the suspension of devolution amid conflict in 1972. The party captured one in four of Northern Ireland’s voters at its height and only 8,000 fewer votes in Belfast than the hegemonic Ulster Unionist Party at one point. Given this, a detailed study of the party, part of an admirable broader Critical Labour Movement series, is a worthwhile project of modern relevance as the old ethno-national and ethno-religious divides may begin to weaken in Northern Ireland. Whilst other authors, such as Paul Bew and Henry Patterson, have produced excellent work in challenging the notion of a monolithic unionism of the 1921-72 era and highlighted the importance of labourist politics, Edwards deserves great credit for producing a definitive account of the political organisation of labourism beyond unionism. Indeed the author does a fine job in constructing a highly readable account of the NILP, sympathetic to its cause of labour, but acknowledging the limitations of its achievements and explaining “why it ultimately failed in its bid to transform the political culture operating within this deeply divided society” (p2). In terms of how to construct a historical account, this is a model book, weaving interviews with former party members with detailed archival trawls, including the NILP’s own records and broader materials in the Public Records Office in Northern Ireland. Edwards acknowledges the importance of the NILP’s 1948-9 decision to support labourist politics within a six county framework. In endorsing the state of Northern Ireland, the party knew it would lose the backing of leftist nationalists, Connolly-ites and other associated groups, whose greenness ultimately outweighed their reddish tendencies (whatever their protestations to the contrary). As the author declares, for the NILP, “1949 spelt the beginning of the end for the ‘broad church’ and its replacement by a decidedly pro-British ethos”. Nonetheless, allying itself more closely with a British project “did not necessarily mean becoming a confessional party and the NILP – from its new centrist political position – continued to barrack its Unionist opponents on their attitudes towards the minority”(p38). Having reduced its electoral reservoir mainly to that of unionist (will a small ‘u’) waters, the NILP did surprisingly well. Having had no Stormont MPs in 1953, the party had four MPs elected in 1958, amid a backdrop of the UUP playing on old constitutional and security fears as the IRA’s Border Campaign was well underway. Moreover, the party claimed that one-third of its members were Catholics. The four seats won in 1958 proved a plateau rather than a base camp, but the party’s 77,000 votes in the 1962 Stormont contest made it Northern Ireland’s second most popular electoral choice. However, that the party had major strength in industrial Belfast, where it garnered 90 per cent of its votes, was also a weakness. In a somewhat agrarian society with only a modestly-sized urban proletariat beyond the capital, the party looked a one-place organisation. The ultimately terminal difficulty for the NILP emerged in the late 1960s with the advent of the civil rights movement. The NILP was sympathetic to its demands, but organisationally not up to leading street protests (as the officials interviewed by Edwards acknowledge) whilst “there was always a danger that the NILP would alienate its hard-earned working class support base” (p140) by becoming involved in protests that quickly became seen as deriving overwhelmingly from one community. As these protests were converted into sectarian rioting and then armed campaigns, the already difficult task of the NILP in promoting cross-community labourist solidarity became increasingly impossible. Belatedly, the UUP government turned to the NILP for positive input into the deteriorating situation and one of its prominent members, David Bleakley, was appointed as Minister for Community Relations. Yet Bleakley could not countenance the lack of power sharing and the assumption that a tough security outlook was the answer to Northern Ireland’s problems, resigning over the introduction of internment. The only disappointing aspect of an engaging and revelatory book is the conclusion, which is too short and needs to more fully address the criticisms of the NILP. Correctly, the author sees the demise of the party amid the horrors of the conflict of the early 1970s as largely unavoidable, as the electorate’s polarisation deepened. However, the conclusion needs to offer a definitive view on the intellectual problem confronting any ‘non-sectarian’ party in Northern Ireland which advocates the constitutional status quo, whether they be labourist like the NILP or more centrist and middle-class like Alliance. Why are the differences between the two traditions on the island so small that they can be overcome amid integration, yet so great that a border is needed to divide and separate those populations? Unionists offer a coherent answer – because those differences of identity do matter considerably, more so than social class distinctions. Republicans also offer a coherent if very different reply – the identity differences are not insurmountable and ultimately the border needs to disappear. The NILP supported partition, but tried to ignore the question. This review was first published by the LSE British Politics and Policy blog on 18th March 2012. Jonathan Tonge is Professor of Politics at the University of Liverpool and a former Chair and President of the Political Studies Association of the UK. Jonathan has produced 14 books and over 50 journal articles and chapters on Irish and British politics and has completed five Economic and Social Research Council and Leverhulme Trust funded projects over the last decade. His most recent books are Loyal to the Core? Orangeism and Britishness in Northern Ireland, Irish Academic Press, 2011, with James McAuley and Andrew Mycock and Abandoning the Past? Political Prisoners and Historical Conflict (with Shirlow, McAuley and McGlynn) awarded the Political Studies Association of Ireland Brian Farrell Prize for best book in politics in 2010. Read more reviews by Jon.